This is a quick overview to compare the four most popular lawn types in Australia. All grasses in this article are warm season grasses, suitable for use in all the warmer regions of Australia. 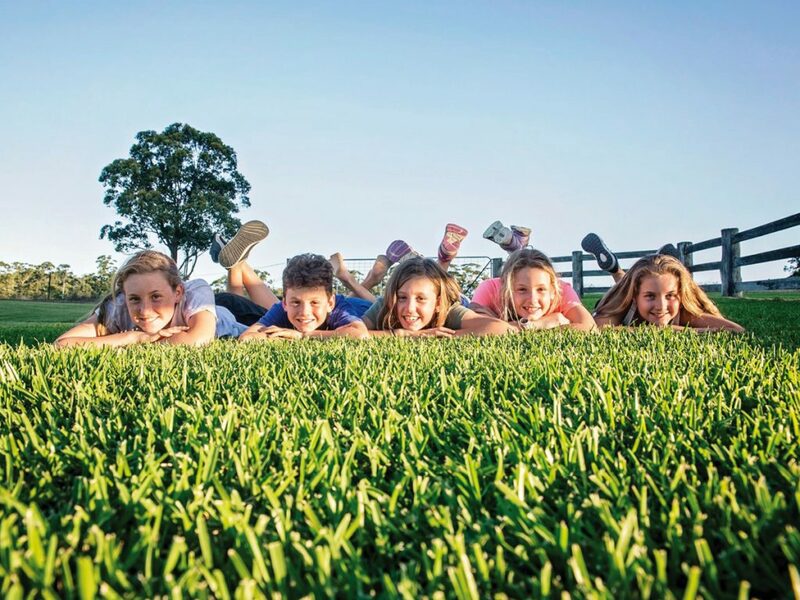 Buffalo grass is a long-standing favourite lawn type in Australia. It is known to be durable and easy to grow and maintain, and of course… Buffalo grass is best known for its very wide leaf blade. Buffalo grass lawns often led to many complaints in days gone by about it’s scratchy nature which was often highly irritating to the skin, especially to the skin of young children who played on it the most. Those days are long past, we the introduction of many quality Soft Leaf Buffalo lawn types. These new soft Buffalo grasses no is longer irritating, are very soft and inviting for play, and can make a beautiful, lush lawn when cared for properly. New Soft Leaf Buffalo types include, Prestige®, Palmetto® and Sapphire®. Zoysia grass had a rocky introduction to Australia, even though it has been in the country for a very long time. This was probably due to the names it was given during its earliest introduction. Names such as Manilla Grass, Korean Grass and Temple Grass just never resonated with Australians – perhaps because they sound more suited to ornamental grasses rather than home lawns. Zoysia however, is a great grass. It is highly tolerant to heat; has very low lawn mowing requirements; very low fertiliser requirements; is salt tolerant; very drought tolerant; looks good all year round in warmer regions; can be forgotten in the winter; has low invasive properties; and it can be abused and recover (at a slightly slower rate than Couch). Zoysia grass has a slightly wider leaf blade than Couch, which tapers to its tip. It is a warm season grass which will enjoy all the warmer regions of Australia, but not the colder regions. Zoysia has both above and below ground rhizomes which greatly aid in its low water use, drought tolerance and recovery. Zoysia deserves to be a far more popular and widely used grass variety in Australia, for homes, business, and government and municipal grounds use. Varieties include, EmpireTM, Jari Blu® and Native NaraTM. Couch has always been a popular lawn type based on its low price, durability and easy care. It can also be made to look top notch without many problems. Couch is a fine leaf lawn which has some excellent qualities. In favour of Couch is it’s, quick growth; ability to withstand wear and tear; quick repair ability; softness; and it can produce a lovely looking lawn when properly cared for and mowed regularly. Couch requires regular lawn mowing in the warmer months, and de-thatching when necessary is also a good idea. Couch grass will also require a good year-round fertilising regime to stay looking it’s best, otherwise it can quickly become straggly, bare and ugly. Couch can quickly creep under fences, into garden beds and other areas which are not our lawn. This happens because of the vigorous underground runners which this grass is known for. A variety of choice is OZTUFF® and Stadium® Couch. Kikuyu was another of the mainstays of Australian lawns in days gone by, as well as still today. Kikuyu grass is named for the most populous ethnic grass group in Kenya. But what sets Kikuyu apart from all other grasses, is that it is fast growing, and can also become invasive. Kikuyu can be high maintenance as it may require weekly lawn mowing throughout the warmer months if it is receiving all adequate requirements. However, Kikuyu is very popular in parks and ovals, and for homes with heavy wear and tear requirements for the lawn, such as having large dogs and busy hard playing kids. Male Sterile Kikuyu is a welcome addition to the Kikuyu family. It is of a higher quality than standard common Kikuyu grass, and has sterile seed heads so it cannot reproduce a new lawn elsewhere if the seed escapes – such as your neighbour’s lawn, or the open environment. A variety of choice is Kenda® Kikuyu.